Throughout the ages, nothing has captivated the human spirit more than the night sky. Philosophers and poets wrote about it, scientists studied it and astronauts explored it. Today, the moon, the planets, the sun, the stars and the universe still inspire childlike wonder in people of all ages, cultures, faiths and walks of life. Ric Edelman was reminded of his childhood fascination with astronomy when someone gave him a 10-inch telescope to commemorate his 40th birthday. With one look at the night sky through that powerful lens, he was firmly hooked on astronomy. Edelman and his wife and business partner, Jean, share a passion for astronomy and are deeply committed to sharing the knowledge with younger generations. “When we travel to remote places, we like to visit observatories where there are dark skies and less light pollution, and we can get better views of the planets and nebulae,” she said. 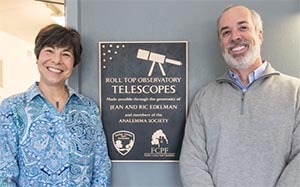 So when the Edelmans learned about a campaign to build an observatory at Turner Farm Park in Great Falls, they saw an opportunity to expand horizons for generations to come, and they made a substantial contribution to the Fairfax County Park Foundation to fund the observatory’s telescopes. 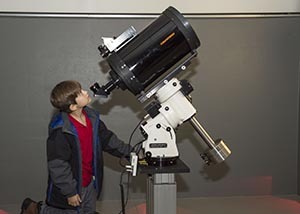 They see it as an investment in the future of countless local school children by giving them an opportunity to explore the night sky and perhaps pique their interest in STEM (Science, Technology, Engineering and Math) education.